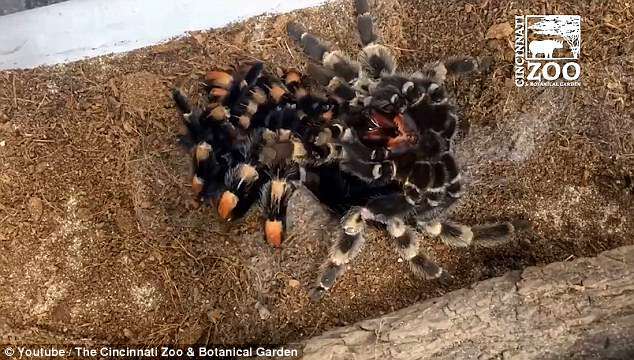 Terrifying footage has emerged showing the creepy moment a Mexican Red Knee tarantula sheds its entire skin. The huge spider, which is mildly poisonous to humans, goes through this moulting process several times during its roughly 30-year existence. The fascinating timelapse condenses the incredible seven-hour process into just a few minutes - and it's guaranteed to make your skin crawl. Thefootage was taken at Cincinnati Zoo and Botanical Garden in Ohio. It shows the tarantula wiggling free of its old exoskeleton which it peels off over its back. 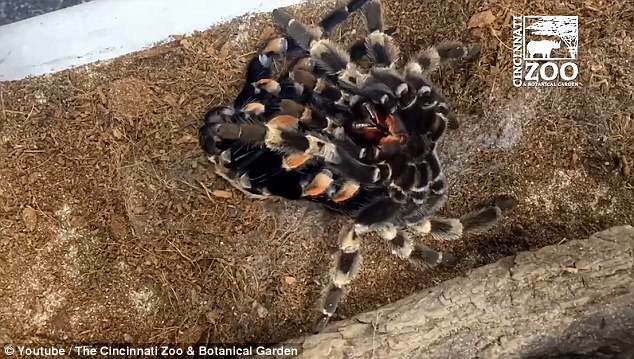 The front part of the tarantula's old skeleton is released first revealing its new skin, which is a more orange in colour. During this process the tarantula contracts its abdomen, pushing fluid into the upper body. The fluid increases the pressure on the exoskeleton, allowing the tarantula to break through its weak spots. After freeing itself from its old skeleton the spider lies on its back with its legs in the air, as seen in the video, which originally appeared on National Geographic. This process happens to the Mexican Red Knee tarantula several times until it reaches its full size of around six inches long. Tarantulas have a stiff outer shell known as an exoskeleton which protects the spider's internal organs. But to grow larger, they must shed their previous exoskeleton, and grow a new one. Red Knee tarantulas naturally live in the Pacific mountains of Mexico in scrub-forest habitat and semi-desert regions. They are best-known for their hairy body and bands along its legs which has made them popular pets. Before the tarantula starts moulting, it goes through several other physical changes. A bald spot on the spider's abdomen becomes larger, and the skin underneath changes from pink to black. 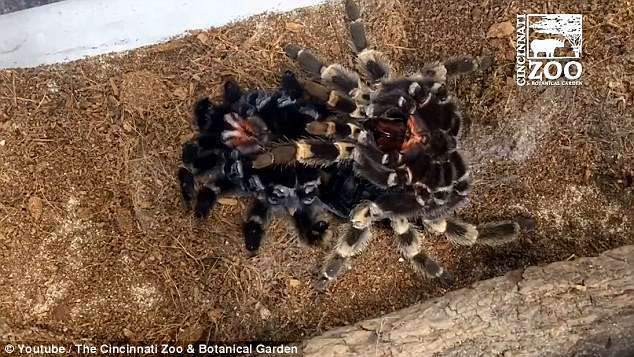 The tarantula's eating habits also change in the lead-up to the molting. 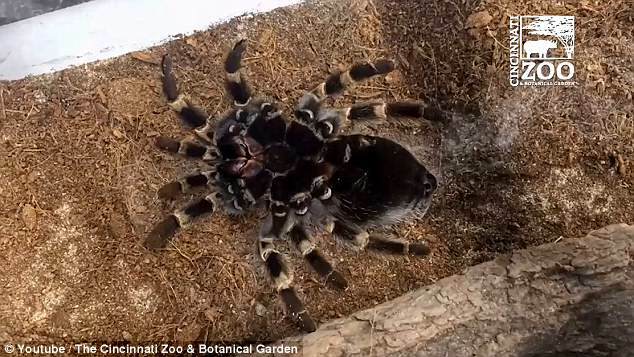 The tarantula stops eating entirely and lays still for two weeks before it molts. According to Dr Shufran, these behaviours are completely normal. 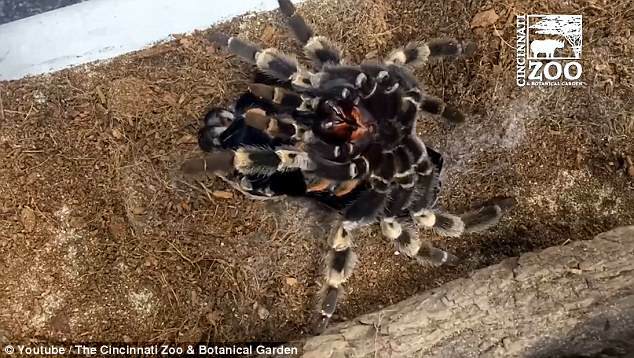 She says that tarantulas often stop eating two weeks before to make sure they don't get stuck in the old shell during the molt. 'Tarantulas that get stuck while molting nearly always die,' she said.